YOU’RE IN THE VELVET NOW! This outfitter is known for his early Velvet hunts that start as early as Mid-August when the thick lush velvet is still on the buck’s antlers yet the antler growth is complete and they are in the drying stage. Keep in mind that this early they are in velvet but you can also hunt them with a rifle instead of a bow or muzzleloader as in most states. Hunting for deer, hogs and Turkeys reduced down to only $ 295 per day. This is a very experienced hunting guide service located the low country of South Carolina Offering quality deer, turkey, and hog hunts at very reasonable prices . We specialize in the back to basic hunting experience we are not a trophy hunting operation we believe that every hunters idea of a trophy is different and that if an animal is a trophy to them than it’s a trophy to us how ever saying that we harvest several trophy Bucks every year and plenty trophy Hogs and turkeys . 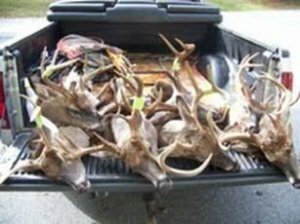 We have a very liberal bag limit in are fall hunts you will be allowed 2 Bucks 1 Hog and 1 Doe on all are 2 or more day hunts. You will enjoy hunting success on thousands of acres of land scattered with tree stands and blinds to ensure plenty of unpressured set ups all stands and blinds are corn well in advance of being hunted we also plant several food plots year round to ensure a healthy herd. We are a small owner operated hunting guide service located in South Carolina’ s famous game rich low country we offer quality hunting trips at very reasonable prices. We hunt on several thousand acres of hunting land which is home to an abundant population of Deer, Turkey and Hogs. We cater to all hunters from the most experienced to the first time hunter and specialize in the family hunting experience we believe that getting youth hunters in the woods hunting is the key to the future of hunting and offer special packages for youth hunts with an adult. We have a 99.9% opportunity rate and the only way to turn that opportunity rate into kill success is to be there. We usually have around 100 hunters between the dates of August 15th and December 31st over 100 hunters for deer and 68 hogs. There is no question that some hunters have found this hidden honey hole. We are in our 5th year of a quality management plan that is producing larger bucks each year. Last year we were taking deer as big as 130 point, 8 points with a 14” to 16” inside spread. If the trend continues we will surpass that size this year. Our base rate is $295 per day per person hunting Deer, Turkey, and hogs. If you hunt 2 or more days you can take 2 deer, 2 hogs and 1 doe deer. Become a hunting group leader and Get Discounted hunts Or Your Hunt free! Discounts are calculated after everyone is booked.